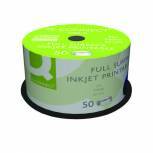 Q-Connect CD-R 700MB/80minutes Spindle (Pack of 50) KF00421 Pack of 1 Q Connect CD-R. Top quality, 52 speed, recordable CD, stores up to 700MB of data or 80 minutes of audio. Suitable for use in both CD-R or CD-RW drives. Supplied in spindle packs of 50. 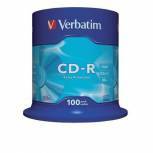 Verbatim CD-R Datalife Non-AZO 80minutes 700MB 52X Non-Printable Spindle (Pack of 100) 43411 Pack of 1 Verbatim 43437 CD-R extra protection. White surface provides extra protection for the vulnerable label side. Can be written on with a CD/DVD marker pen. Capacity: 700MB. Speed: 52x. Spindle of 100. 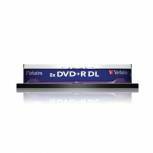 Q-Connect DVD-R 4.7GB Cake Box (Pack of 25) KF00255 Pack of 1 Writable CDs for an easy and quality solution to storage problems. Can be used in CD-R and CD-RW drives without any problem. Easily transported with a durable safety. Provides easy storage of data. High value equivalent to big brands. Capacity: 4.7GB. Q-Connect DVD-R 4.7GB Cake Box (Pack of 50) KF15419 Pack of 1 Writable CDs for an easy and quality solution to storage problems. Can be used in CD-R and CD-RW drives without any problem. Easily transported with a durable safety. Provides easy storage of data. Capacity: 4.7GB. Pack of 50. 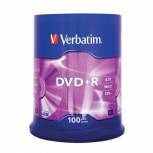 Verbatim DVD-R 16x Non-Printable Spindle (Pack of 100) 43549 Pack of 1 Verbatim DVD-R matt silver. Matt surface can be written on with a CD/DVD marker pen. Perfect for sharing computer data, home videos, photos and music. Capacity: 4.7GB. Speed: 16x. Spindle of 100. 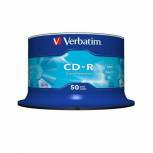 Verbatim CD-R 700MB/80minutes 52X Spindle (Pack of 50) 43351 Pack of 1 Verbatim CD-R extra protection. Up to 100 years archival life. White surface provides extra protection for the vulnerable label side. Can be written on. Perfect for computer data, home videos, photos and music. Capacity: 700MB. Speed: 52x. Spindle of 50. Q-Connect Inkjet Printable DVD-R Discs 16x 4.7GB (Pack of 25) KF18021 Pack of 1 Q-Connect DVD-R the affordable choice for data backups and Video DVDs. Single-layer discs with 4.7GB of capacity for documents, images, etc. Features inkjet printable label surface for customisation using a compatible printer suitable to print on DVDs. 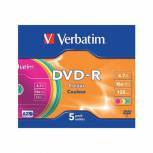 Verbatim 4.7GB Non-Printable Jewel Case DVD-R (Pack of 5) 43557 Pack of 1 Verbatim DVD-R colour. Different colours provide options for categorisation. Can be written on with a CD/DVD marker pen. Perfect for sharing computer data, home videos, photos and music. Capacity: 4.7GB. Speed: 16x. Pack of 5 jewel cases. 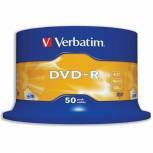 Verbatim 4.7GB 16x Speed Spindle DVD-R (Pack of 50) 43500 Pack of 1 Verbatim DVD-R matt silver. Matt surface can be written on with a CD/DVD marker pen. Perfect for sharing computer data, home videos, photos and music. Capacity: 4.7GB. Speed: 16x. Spindle of 50. 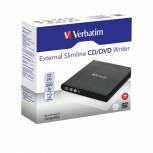 Verbatim 4.7GB 16x Speed DVD+R Spindle (Pack of 100) 43519 Pack of 1 Verbatim DVD+R matt silver. Matt surface can be written on with a CD/DVD marker pen. Perfect for sharing computer data, home videos, photos and music. Capacity: 4.7GB. Speed: 16x. Spindle of 100. 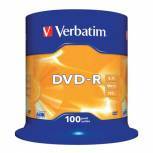 Verbatim DVD+R 8X Double Layer Non-Printable Spindle (Pack of 10) 43666 Pack of 1 Verbatim DVD+R double layer matt silver discs. Matt surface can be written on with a CD/DVD marker pen. Perfect for sharing computer data, home videos, photos and music. Capacity: 8.5GB. Speed: 8x. Spindle of 10. 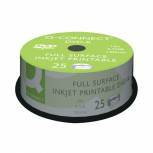 Q-Connect Inkjet Printable CD-R Discs 52x (Pack of 50) KF18020 Pack of 1 Supplied on a spindle of 50 discs ideal for creating music CDs and data backups. Top 52x write speed and standard 700MB capacity. Features an Inkjet printable label surface for customised labels using a printer able to print on CDs. 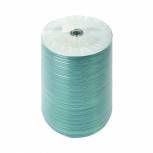 CD-R Spindle 80min 52x 700MB (Pack of 100) WX14186 Pack of 1 CD-R Spindle 80min 52x 700MB Pk100. 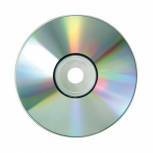 Multi-speed 80 minutes 700MB bulk pack recordable CDs. Up to 52x recording speed. Supplied on a plastic spindle of 100. 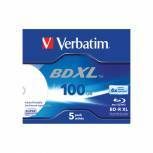 Verbatim 4.7GB 4x Speed Jewel Case DVD-R (Pack of 5) 43246 Pack of 1 Verbatim DVD-R matt silver. Matt surface can be written on with a CD/DVD marker pen. Perfect for sharing computer data, home videos, photos and music. Capacity: 4.7GB. Speed: 16x. Pack of 5 in jewel cases. 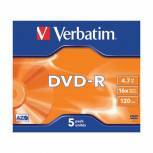 Verbatim DVD-RW 4X 4.7GB (Pack of 5) 43285 Pack of 1 Verbatim DVD-RW matt silver re-recordable discs. Matt surface can be written on with a CD/DVD marker pen. Perfect for sharing computer data, home videos, photos and music. Capacity: 4.7GB. Speed: 4x. Pack of 5 in jewel cases. 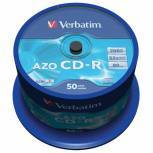 Verbatim CD-R 700MB 80minutes Spindle (Pack of 50) 43343 Pack of 1 Verbatim CD-R AZO Crystal. Up to 100 years archival life. Crystal clear lacquer surface to provide extra hard protection. Can be written on. Perfect for sharing computer data, home videos, photos and music. Capacity: 700MB. Speed: 52x. Spindle of 50. 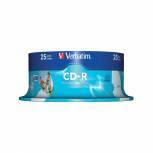 Verbatim Crystal 700MB Slim Case CD-R (Pack of 25) 43322 Pack of 1 Verbatim CD-R AZO wide inkjet printable. Up to 100 years archival life. White surface for inkjet printing up to the hub. Print area: 23 - 118mm. Perfect for sharing computer data, home videos, photos and music. Capacity: 700MB. Speed: 52x. Spindle of 25.